Narratively, New Super Mario Bros U Deluxe is just as dumb as Mario titles tend to be, with the story opening with a tea party at the terminally insecure castle of Princess Peach. As is utterly expected, Bowser invades the Mushroom Kingdom with the Koopalings in their narcissistic airships and generally causes a menace. 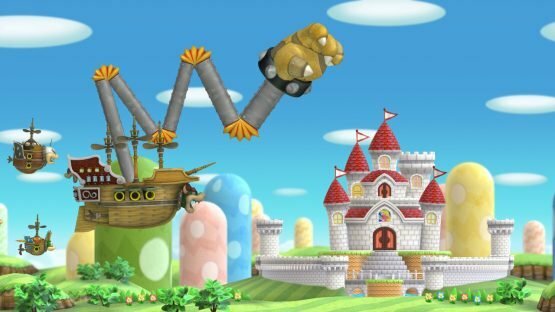 During said menace, Bowser flattens and then flings our heroes using a giant mechanical hand to the opposite side of the Kingdom, causing probably irreparable damage to a tree containing ominously cute acorns before running towards Peach’s Castle through a rain of said acorns to save her from her palatial imprisonment. 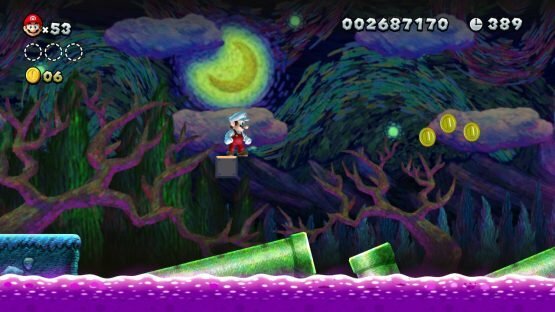 Then the player is immediately thrown into the game in World 1, as the character (or characters in multiplayer) of their choice. In this collection, the playable choices include the usual suspects (Mario, Luigi, Toad) along with Nabbit, the invincible cutie that could only previously be played in New Super Luigi U, and Toadette, who is entirely new to the game. Both Nabbit and Toadette are essentially the “easy mode” characters, with each of them having abilities that trivialise a lot of the challenge of the game. Nabbit is completely invulnerable to damage from enemies, although he can still be crushed and fall to his death, so caution is still needed to keep that life count up. Toadette has access to the Super Crown, an item exclusive to her alone (sorry Luigi), that changes her into Peachette, allowing the use of a glide ability similar to Peach’s well known ankle-showing float, a double jump, and she is automatically boosted out of any pits she might fall into. All this makes her the perfect character to select for an inexperienced platform player. Most of the gameplay plays out exactly as you would expect from a 2D Mario game, with a world map and all the running, jumping, coin and power-up collection that you’ve come to love. Multiplayer is played through drop-in play, with players able to drop in and change characters through the menu options on the world map, along with quick saving and checking progress. 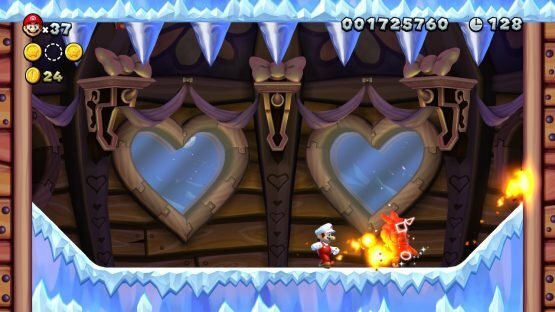 There’s a whole host of different power-ups throughout the game including returning favourites like the Super Mushroom and Ice Flower, joined by the new Super Acorn that grants you the Flying Squirrel suit, which is both adorable and functional, allowing a second jump and kind of glide, as well as the ability to temporarily grip walls. 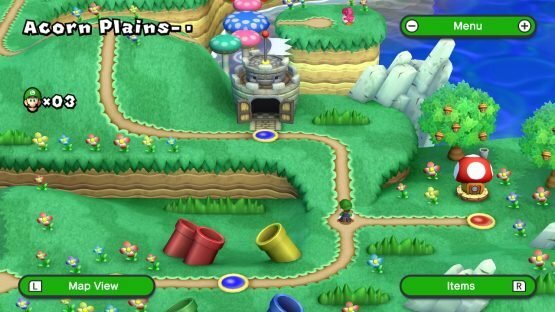 Returning as well are the castles and fortresses ended by battles with a miniboss (Boom Boom or Pom Pom) or one of the Koopalings respectively. These obviously get more difficult as you progress with different gimmicks added to the fights (like ice or pits to not fall into) but, in true Mario style, can all be resolved with three swift clouts to the head. Returning is the tried-and-tested formula of themed worlds; including, but not limited to, a indistinct grassy world, an ice world, and a water world. Along with the stalwart New Super Mario Bros. mechanic of three Star Coins to find in each level too for completionists out there (or people that can’t stand seeing the outline of the things you have missed in game – like me). Some of these Star Coins are quite devilishly hidden too, often requiring an astute eye to even get to the areas that contain them. So, it’s best not to barrel through the levels as even items like Koopa Shells can be used to break certain blocks or even need to be thrown to reach Star Coins that would otherwise be impossible to obtain. This might sound like all typical stuff found in other Mario games, and it is, but it can’t be impressed too much how solidly all of these mechanics are implemented within every moment of the gameplay. The 2D Mario formula might not have changed all that much in thirty years, but Nintendo are incredible adept at these games now, and it shows in just how well constructed it is overall. This isn’t all, as coupled within this wonderful game is also the New Super Luigi U title, an entire remix of the entirely of the original game with far greater difficulty. 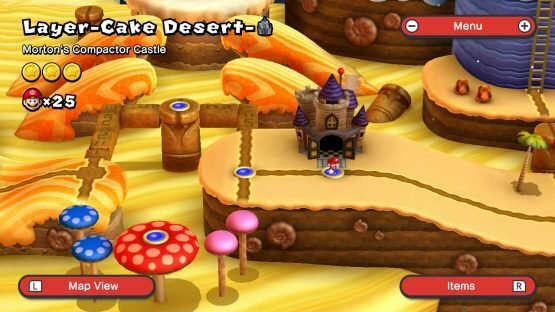 So, once you’ve seen everything New Super Mario Bros U has to offer, make sure you jump into this as the additional challenge definitely makes the second visit worth it in my opinion as the main game can be a little easy for long-time Mario players. In fact, the only negatives from a gameplay perspective comes from a certain couple of factors in the controls. Firstly, pressing the jump in air activates the spin jump in mid-air instead of its original mapping in the Wii U to ZR, meaning that A LOT of jumps are thrown entirely off to intense frustration. So, expect to overshoot jumps a lot until you adapt to this. Secondly, the controls cannot be remapped outside of switching the two run and action buttons with the two jump ones, meaning that the above problem can’t even be rectified. This is really shocking considering the sheer amount of remapping available in most modern games. Come on Nintendo, it’s 2019, join the present era with us. Visually, you know what you’re getting with a Nintendo game, a polished and bright experience namely, and New Super Mario Bros U Deluxe is no exception. The only problems it suffers from here is that only a couple of levels stand out in a memorable way visually, whilst the rest are simply blocks and enemies against forgettable (if pretty) backgrounds. The music also suffers a little from the same fate. It’s good, don’t get me wrong, but there’s nothing here to stick with you after the credits roll and the game ends. The music and all sound design is distinctly Mario, sure, but indistinct when it comes to attempting to separate this title from other ones in the franchise. The overall presentation is solid, just not groundbreaking in any way. New Super Mario Bros U Deluxe is released Friday January 11th 2019.